In a recent online discussion involving ethics somebody only somewhat jokingly said something along the lines of “Most people only abide by the Rules of Acquisition anyway.” and I thought to myself: Would that really be so bad? In case you don’t know him, this handsome gentleman is Quark, bar owner and small-time smuggler / fence at Deep Space 9 (DS9), a fictional space station in the Star Trek universe and eponym of a successful TV series. Within this universe, the Ferengi are a caricature of free-market enterprise. Their Rules of Acquisition, a codex, a set of rules for Ferengi to live by, though quite tongue-in-cheek at times reveal surprising wisdoms. The Star Trek franchise commonly is seen as this Hippie, pacifist, starry-eyed vision of the future. To all intents and purposes the human society depicted in it is built on a post-scarcity economy. However, strangely enough all its heroes are career military officers – soldiers essentially – no matter how avidly they profess themselves to be benevolent explorers (Columbus, Cortés and Pizarro were ‘explorers’, too by the way, to name just a few very real, historical examples: The former famously cut off the ears of natives who opposed him while the latter two by modern standards quite arguably committed downright genocide). Capitalism is often seen has having an overall negative impact on society to the extent that for the far (and sometimes not-so-far …) left it’s their raison d’être and the prime evil to fight against. In contrast to that, states and its representatives are mostly seen as altogether beneficial to society. Until the 1970s the military were largely considered heroes without much criticism levelled against them. Compared to that, business people are often depicted as dodgy and underhanded and the world of business frequently is painted as dirty and immoral, with profit maximisation being its only compass. In my opinion though doing business – in an ethical manner, mark you – most of the times not only is the profitable but also the moral option. Business and a free market in particular is all about connecting with people, communicating with them and hopefully achieving the best possible outcome for all parties involved. In other words: Trading with people instead of shooting them! This might seem like an unequivocal Ayn Rand / “Who’s John Galt?” kind of position and you might rightfully object that it is a somewhat naïve one. While that objection is valid and this position certainly has to be to taken with a pinch of salt – not every businessman will behave ethically every time after all – free-markets and globalization have done more for lifting people out of poverty than politics ever could, which is why I stand by my belief that the world would be a better place if we did more business with each other instead of getting involved in political power plays or fighting senseless wars for vainglorious, lofty reasons. Coming back to Star Trek, the Ferengi and DS9, I think Quark is about the only character in that show who actually behaves ethically and who lives up to some sort of moral standards. 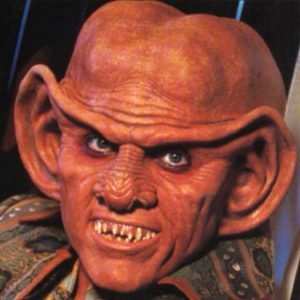 While pretty much every other character acts furtively and cheats, betrays and kills to achieve his or her personal goals, Quark’s always honest about just wanting to make a profit and tries to do business with every person and the occupying force du jour (which of course is construed as collaboration by whomever opposes that force).